Dealing With an Old Garage Door Opener? Here’s 4 Reasons It’s Time to Update! Your garage door opener functions dutifully day-in and day-out for years. A day may come where you notice that your garage door will not open or close correctly. This problem can leave your property open to theft and weather concerns, as Florida heads toward its stormy season. Spring is here, and now may be the perfect time for you to invest in a new garage door opener to replace your outdated equipment. Doing so can provide a lot of benefits, four of which our team will cover today. Guaranteed Garage Repair is here to serve as your source for garage door repairs across Southern Florida. 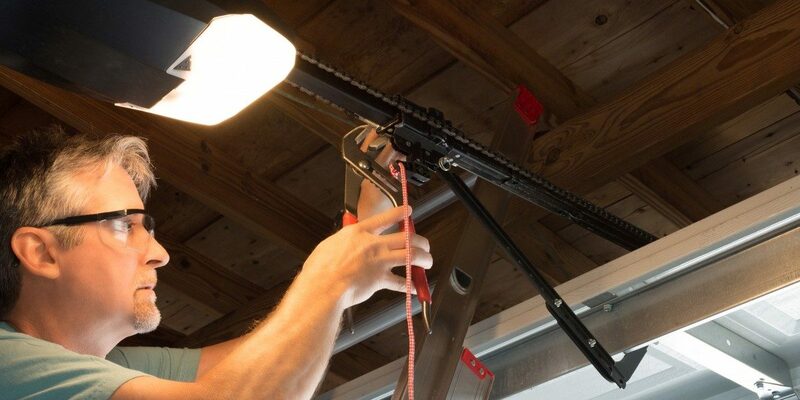 We also provide garage door opener services across Port St. Lucie, Sebastian, and the surrounding areas. Our contractors proudly provide results so great that we guarantee them! Today, we’ll highlight the top reasons why now may be the perfect time to buy a new garage door opener. If you’re ready to get started, be sure to contact us today to see how affordable our services can be! Safety should always be a top priority for every business and household. If your overhead door system relies on an outdated opener, then it’s important to check regularly to ensure that all safety features are up to date and operational. Florida homeowners in possession of garage door openers installed before 1993 may still be relying on a mechanical-only reversal system. It is highly recommended to seek out a new garage door opener installation if yours is out of date. Doing so can provide a cost-effective way to achieve peace of mind. Garage doors used to rely on DIP-switch systems to provide a customized signal for homeowners to communicate between their opener and remote device. While secure against normal intrusions, older garage door openers rely on toggle systems that can easily be hacked, giving intruders easy access into your garage. The last 25 years have seen considerable improvements in garage door security, including modern opener systems that deploy rolling code technology. Whereas your old system could be accessed in less than 30 seconds, this new device relies on over one billion unique password combinations that change after every use. Outdated garage door systems often rely on older-style chains to open and close the door, creating a considerable amount of noise. Friction can produce a lot of decibels, disrupting others in your home every time you open or close your garage door. Households with rooms above the garage or individuals that leave early can benefit from investing in a new garage door opener. Ready to create a smooth, quiet operation? Be sure to check your tracks, and invest in new rollers of your current pieces are comprised of metal or otherwise cracked. Need help? Our garage door repair team can offer industry-leading assistance! Technological improvements have allowed us to become more connected than ever, and the same can be true for our homes. You can check the status of new garage door system, open and close it remotely, and more from the convenience of your tablet or smartphone. Newer models rely on your home’s Wi-Fi to provide a range of benefits. Need to lock your garage door? No problem. Want to use your voice to do so? Options are available! Ready to Install Your New Opener? Now may be the perfect time to install a reliable and quiet opener in your Florida home. Guaranteed Garage Repair is proud to install garage door openers across Port St. Lucie, Sebastian, and beyond. We provide complete assistance, and will help you achieve an affordable and long-lasting result. We can install your opener for only 299 dollars plus tax including installation, delivering years of success and peace of mind. Contact us today to learn more about our services, and be sure to schedule any needed garage door repairs for the best results!